In 1985-1991, Andrey Bystritskiy was engaged in research as a Senior Fellow at the Academy of Pedagogical Sciences. He has been in the media industry since 1991, starting as the Head of the Audience Research Department of the All-Russia State Television and Radio Company (RTR), author and host of radio and television broadcasts. In 1993-1996, Andrey Bystritskiy headed sociological research at the Company. From 1996 to 1997, he was in charge of the "Society" Department at the Itogi (Russian Newsweek) magazine. In 1997-1998, Andrey Bystritskiy was Deputy Director General for Information at TV Tsentr. Between 1998 and 1999, he was the Producer of the Russian news service on BBC. In 1999, he joined the Organizing Committee of the Unofficial Moscow Festival as one of its Co-Chairs, he was also a member of the Editorial Board of the Moscow Alternative newspaper and Chairman of the Mayak State Radio Broadcasting Company (main information radio in Russia). In 2000, Bystritskiy became the Director General of the Vesti State Television Company (an entity of RTR). From 2000 to 2008, he was Deputy Director General of RTR and the Director of the Department of Information Programmes of the Russia TV. In 2000-2013 Bystritskiy was a member of the Board of Directors and Vice President of international broadcasting company Euronews. Between 2005 and 2007, he was the Editor-in-Chief of the Apologia monthly magazine. From 2008 to 2014, he was the Chairman of the Voice of Russia State Radio Company (Russian international broadcaster in 44 languages). 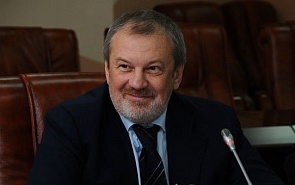 Andrey Bystritskiy has been at the National Research University – Higher School of Economics since 2001, as a Dean of the Faculty of Communications, Media and Design since 2014. Since 2008, he has been the head of the Council of the Heads of Government and Public Television and Radio Organizations of CIS Countries. Since 2014, Bystritskiy has been the Chairman of the Board of the Foundation for Development and Support of the Valdai Discussion Club and the Chairman of the Public Supervisory Council of the Russian Ministry of Communications. Andrey Bystritskiy is a Professor and PhD (Pedagogics, 1989). He is a member of the Union of Writers. In June 2007, he received the Order of Honour. Andrey Bystritskiy is the author of books, including such works as Youth Subcultures and Russia's Intelligentsia During the Demise of the Soviet System (1991), and numerous publications in newspapers and magazines. Today’s world may have fallen into one of the most dangerous situations in its entire history. The world as we know it seems to face death. And the reason for this is the discrepancy between the intellectual capabilities of mankind and its power in the context of globality. From now on, the entire humanity has one destiny. But who is able to manage it properly? What type of rationality do we need to make decisions of global scale? As this text is being written and read, the developments in Venezuela can take the most unexpected turn. Who will win? Maduro or Guaidó? The parliament or the president? Of course, in the end the problem will be solved by the will, initiative, courage, ingenuity, strength of either party. But what about the rule of law? We live in a complicated, tangled and staggeringly interdependent world that is undergoing tectonic shifts. This is what the president of Russia spoke about at his annual news conference, where he devoted considerable attention to the international situation. ﻿The large Annual meeting of the Valdai Discussion Club in Sochi is finished. To most observers, it will be remembered by the bright statements of the President of Russia and concerns about the fate of the Saudi journalist Jamal Khashoggi, who previously took part in the Valdai Club conferences. In the second half of October, the Russian Black Sea resort of Sochi will host the next Annual Meeting of the Valdai Discussion Club. This year’s topic is “Russia: Agenda for the 21st Century.” It is clear that it will be about Russia, but about Russia in the international context, Russia in the big world, Russia in the global game. A new world is emerging right before our eyes, and therefore we must understand what it will be like and how Russia will exist in it. It is not only me who has a strange feeling of anxiety, approaching danger, a sense of tragic outcome in the current world situation. The most striking thing is that there are no so many rational grounds for such eschatological experiences. More precisely, only a couple of them: the incredible power and wealth of modern mankind, and the eternal limitations of the mental abilities of people, especially politicians. ﻿Not only the Russians are the slow starters who drive fast. It appears that this is true of the Americans as well. In any case, one can’t help getting this impression amid the flurry of reports about the upcoming summit between Vladimir Putin and Donald Trump. Of course, we can only speculate on its outcomes until it actually takes place. Political Time Machine: Where to Go? The current conflicts can play a positive role, because progress only comes from contradictions. So the current difficulties need to be discussed, creating an imagined future, the route toward which will be determined during the discussions. There is no way other than intellectual comprehension of existing problems. ﻿The Russian-Chinese relations can be called excellent. However, this is what makes one think very seriously about the future of these relations. It is the main problem of any success: having achieved something, one always has to stop and think what to do next.